Data Loss doesn't only happen with misplaced USBs, even sending an unencrypted email with confidential or personal information risks personal identity theft and corporate fines. QuickCrypto can prevent this by encrypting email messages and attachments. Lock out the bad guys and prevent data loss accidents. Have you accidentally deleted important files? With QuickCrypto already installed you can attempt to recover deleted files and those removed from the recycle bin. More care needs to be taken if you do not already have QuickCrypto installed (as installation of software may overwrite deleted file data). Working out of the office, hot desking at the coffee shop, or on a sales trip? It brings its rewards but also its data dangers. Don't let that confidential proposal slip into the wrong hands, use QuickCrypto to easily protect your most confidential information and leave everything else as you currently know it. Hackers have an easy job if you use simple (and even worse - the same) password for online activity and keep your data unencrypted. The QuickCrypto Password Manager creates strong, secure passwords and keeps them for you in an encrypted Password Safe that you can take with you on a USB Stick! USB Memory Sticks are useful, fast and can contain a lot of data. They are used at home, at work and make transporting data very easy. This flexibility turns nasty if you lose the USB stick. Then data is lost - identity theft, hacking, password loss can all follow with serious personal, financial and corporate regulatory outcomes. Is your PC shared at home? Do you keep restricted movies, information or pictures on the jointly used machine? Do you want to risk offending others and potential embarrassment? QuickCrypto can easily encrypt, and also hide these files (remove from the normal file system). PCs track and record a mass of user activity. Think clearing down your browser history removes this? It doesn't. Think you have deleted a file so it can't be seen again? It can be. QuickCrypto has advanced recovery options to view and erase this data. 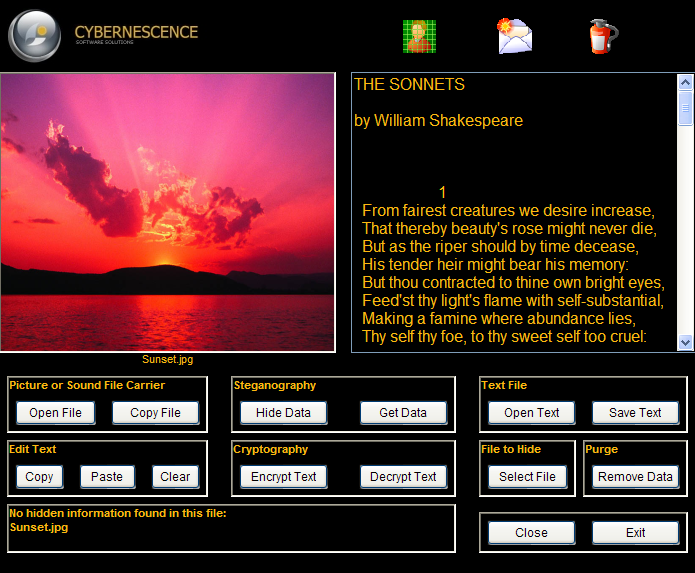 Hide text messages and/or files (either can be encrypted first) within a picture image or sound file. Only other QuickCrypto users can access the information. Every one else will just see an ordinary picture or hear the sounds normally. File and folder encryption using super-strong encryption algorithms. Lock files and entire folders using passwords, key-files or both (two factor authentication). Create and use encrypted vaults - simple 'on the fly' encryption! Easily encrypt emails and email attachments. Recipients of encrypted emails do not even need QuickCrypto to decrypt the files (though they do need to know the password!). Integrates smoothly with existing email software. Store passwords in encrypted password categories and generate real-random passwords with the secure password generator. Keep all online/offline passwords in one safe place and export these into portable encrypted archives. Files that are deleted using Windows and normal software are not securely deleted. Secure file erasure is achieved with the included file shredder (DoD 5220.22-M compliant) to wipe and destroy files, folders beyond recovery. And there is so very much more ... please click on the links (below left) to discover more about QuickCrypto's capability. Hide files on your system so only you can recover and use them. Also conceal sensitive data (text and files of any type) into innocent 'carrier' files: JPEG, GIF, BMP, MP3 and WAV. 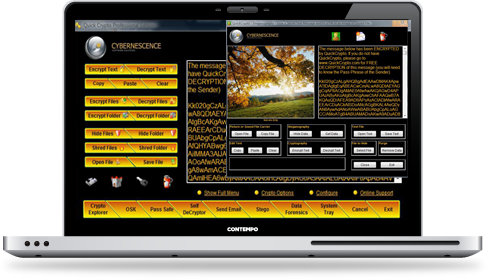 Easily blend encrypted files and messages into many other files. Accidentally 'permanently' deleted a file? Often	deleted files that that aren't securely shredded before deletion (e.g. those emptied from the recycle-bin) can be recovered from NTFS and FAT drives (this covers most systems). Use QuickCrypto to inspect and remove PC system audit files, including recently accessed files, page files, flash cookies, temporary files. Deleting internet browser history does not permanently remove traces. QuickCrypto can analyse 'index.dat' files, temporary internet files, IE, Chrome and Firefox cookie and history files and can permanently erase these if desired. Encryption can require a password and a token created from any file on a removal USB drive. This ensures that decryption can only take place when a person both knows the password and also has the secure token/key file on a dongle or USB drive. QuickCrypto employs the AES standard as described by FIPS PUB 197. The random number generator generates cryptographically secure random numbers to the strict NIST SP800-90 standard (FIPS PUB 140-2). Over time PC systems acquire many temporary internet and installation files that are left behind serving little purpose. Some temporary files and deleted files can also betray confidential information. QuickCrypto can 'clean' and remove these digital remnants. The CryptoExplorer ™ function provides a secure alternative to Windows ® Explorer and enables 'at a glance' knowledge of encrypted and QuickCrypto hidden files (not simple attribute hiding - files are removed from the standard files system and are not normally viewable). 'Brute force' password cracking (repeatedly trying millions of different passwords until the correct one is found) is the only method open to decrypting a file. 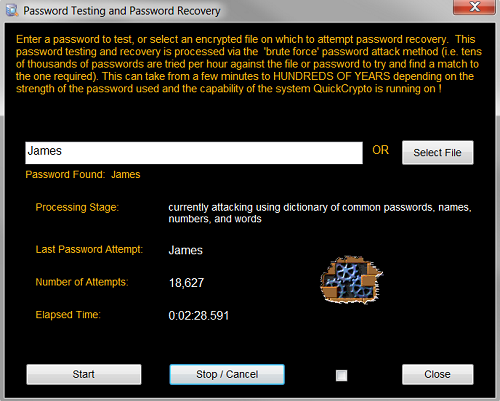 QuickCrypto provides such a facility to enable you to check and test your chosen passwords. QuickCrypto can monitor your system for potential security flaws that may compromise your cryptographic security. New start-up programs, spawned processes, installed programs, critical system files, scheduled tasks, file associations and more can be monitored. QuickCrypto can open TrueCrypt Volumes (assuming you know the relevant password)! I am very impressed with the program, which has recovered files allegedly shredded with [another product] over the past two years on my XP machine." Your product is excellent. I am particularly enjoying its easy-to-use interface, as well as the wide variety of encryption features it has." We have developed our first lab with QuickCrypto and we've used it so far with several different groups of high schools. We have gotten nothing but RAVE reviews from the high school teachers. The kids really love your software. Yours is the only one that is inexpensive that works fast. I found one that is free but I never got it to finish because it was taking so long that I would give up on it ..."
Thank you very much indeed for persevering with contacting me and for your most generous offer. I intend to recommend your product to our Photographic Society"
Thank you kindly for your prompt response to my inquiry. I appreciate it greatly and wanted to take the time to tell you how much I like your software." "It is the best product of its kind that I have ever used." The free QuickCrypto iPhone 4 email encryption web app is available now! The Free Web App Works On iPads Too! The QuickCrypto iPhone email encryption app is simple to use. Just type in the email message text, choose and enter a password and tap 'Encrypt Text'. Then simply tap the 'Send Email' button and an email will be prepared and ready to send to any of your email contacts using the built in iPhone 4 mail app and contact center. To decrypt an encrypted email, just click the link on the email and the QuickCrypto iPhone email app will load with message ready for decryption. Entering the correct password then reveals the secret message. If you want this web app, you can put it front and center on your Home screen. Just open the web app on your iPhone, iPad or iPod touch, tap the 'plus sign' (or as left on new iOS), and then tap “Add to Home Screen.” An icon will be added to your Home Screen automatically for easy, one-tap access. copyright © 2017 cybernescence ltd. all rights reserved.